Linux system admins often need to monitor system resources like cpu, memory, disk, network etc to make sure that the system is in a good condition. 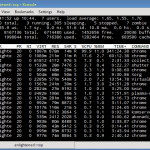 And there are plenty of commands like iotop, top, free, htop, sar etc to do the task. 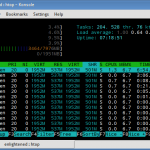 Today we shall take a look at a tool called collectl that can be used to measure, monitor and analyse system performance on linux. Collectl is a nifty little program that does a lot more than most other tools. It comes with a extensive set of options that allow users to not only measure the values of multiple different system metrics but also save the data for later analysis. Unlike other tools, which are designed to measure only a specific system parameter, collectl can monitor different parameters at the same time and report them in a suitable manner. Unlike most monitoring tools that either focus on a small set of statistics, format their output in only one way, run either interatively or as a daemon but not both, collectl tries to do it all. You can choose to monitor any of a broad set of subsystems which currently include buddyinfo, cpu, disk, inodes, infiniband, lustre, memory, network, nfs, processes, quadrics, slabs, sockets and tcp. Take a peek at the command before we start digging deeper. The cpu usage, disk io, and network activity is being logged every second. The data is not difficult to read for those who understand it. The list keeps growing at a defined time interval and is easily loggable to a file. And collectl provides necessary options to record, search and do other useful things with the data. Ubuntu/Debian and the likes have Collectl is available in the default repositories, so just apt it. Fedora/CentOS too have it in the repos, so grab it with yum. Different types of system resources that can be measured are called subsystems. Like cpu, memory, network bandwidth and so on. If you just run the collectl command, it will show the cpu, disk and network subsystems in a batch mode output. That has already been shown above. According to the man page, collectl identifies the following subsystems. will  only  see a single total taken across all 3 disks. If one chooses -sD, individual disk totals will be reported but no totals. Choosing -sdD will get you both. To monitor and measure a particular subsystem use the "-s" option and add the subsytem identifier to it. Now lets try out a few examples. 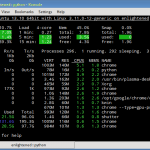 To monitor just the summary of cpu usage use "-sc"
To observe each cpu individually, use "C". It will output multiple lines together, one for each cpu. Using the C and c option together will fetch you both individual measures and the summary stats in a mmore comprehensive manner, if you need. Should not be difficult to interpret. The M option would give further details about the memory. Does that look similar to what free reports ? The d and D options provide the summary and details on disk usage. Another option that provides extended information is the "--verbose" option. It expands the summary to include more information but is not identical to using D.
So lets say you want a report of cpu, memory and disk io together, then use the subsystems together. To display the time in each line along with the measurements, use the T option. And over that, to specify options, you need to use the "-o" switch. You could also display the time in milliseconds with "-oTm". Every row the collectl reports is a snapshot or sample. And it takes these snapshots at regular intervals, say 1 second. The i option sets the interval and c option sets the sample count. The above command would collect memory stats every 2 seconds. Out of the plenty options, the "top" option makes collectl report process-wise statistics much like iostat/top commands. The list is continuously updated and can be sorted on a number of fields. The output is very similar to the top command and it sorts the process by the amount of disk io in descending order. To make collectl report like top, we just have to report processes ordered by the cpu usage. The above command will list out all the processes much like "ps -e". The 'procfilt' option can be used to filter out specific processes from the process. The 'procopts' option can be used to specify another set of options for fine tune the process list display. The following command would collect "5 samples" of CPU statistics at "1 second" interval and print detailed information (verbose) along with the time. Change the "-s" parameter to view a different subsystem. The post so far was just a bird's view of this amazing tool called collectl. It should have given a fair idea of how flexible it is. The discussion however leaves out various other features of collectl which include the ability to record and "playback" the captured data, export data for various file formats and data formats that can be used with external tools for analysis etc. Another major feature that collectl supports is running as a service that allows for remote monitoring making it a perfect tool for keeping a watch on resources of remote linux machines or an entire server cluster. Collectl is accompanied with an additional set of tools named Collectl Utils (colmux, colgui, colplot) that can be used to process and analyse the data collected. May be we shall take a look at those in another post. Check the man page to learn more about the options. I would also recommend checking out the FAQs to get a quick idea about collectl. Next, read up the collectl documentation for more indepth examples to get beyond the basics. There is also a command equivalence matrix which maps the more common commands like sar, iostat, netstat, top with their collectl equivalents. 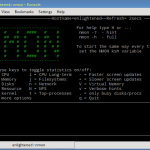 So the tool is able to monitor only Linux? i think that it is much better to add the function of being able to work with Window as well as there are a lot of people who are with Windows and they will be attracted to it. For example, the tool Anturis, offers many options and that is why people are attracted to it. I hear what you’re saying about windows, but when I wrote collectl the actual focus was on High Performance Computing and at the time that meant linux. Believe it or not I did fiddle around with some of the windows performance counters and even hacked up something that would read the counters and then call the collectl print routines. And it sort of worked, but there are just so many existing tools for windows I figured we didn’t need another and I didn’t want to distract myself with dealing with yet a whole other operating system. A personal philosophy I’ve tried to live by with collectl is to ‘do a couple of things real well rather than a lot of things that are just mediocre’ and so there are no GUIs for collectl and no centralized cluster monitoring. Collectl’s focus is on gathering/logging metrics efficiently and making them available for others to consume via a plugin mechanism and by making them available over a socket.